Up to 1965 London and Overseas Freighters Ltd. had been amassing a fleet of very modern ships though some of its earlier buildings were now reaching up to 14 years of age, these ships were proving to be too expensive to operate on the British Register, so four of its oldest ships transferred to the Greek Flag operated by a new Company called Mayfair Tankers which was registered in Liberia. This was not a tax evasion exercise because all profits reverted to the Parent Company; it was just an exercise in trying to keep the older ships operational at a profit before finally moving them on. Built: 1965 By Uddevallavarvet A/B Uddevalla, Sweden. Tonnage: 10,893g, 6,198n, 15 120 dwt. Engines: Single Screw 8 Cylinder 2S.C.SA Gotaverken, 10,000 BHP, 16.5 Knots. Launched on the 26th March 1965. completed on the 21st September 1965. Yard No. 260. After twelve years service with the London and Overseas Freighters Ltd. Fleet she was sold to Litra Shipping Corporation, Greece and renamed Plotinos. On the 23rd December 1981 she was laid up at Argostoli in Greece and then transferred to Glaxidi in June 1982. In 1986 she was sold to Vito Shipping Limited of Malta, renamed Vito. 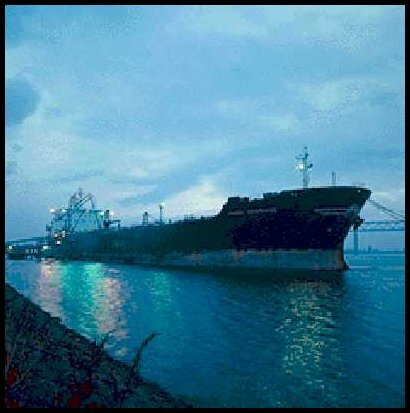 The same year sold again to Gautam Shipbreaking Industries of India for demolition at Port Alang, work commencing November 1986. Most of London and Overseas Freighters Ltd. tankers traded on the spot market and the Company continued to make a loss, new super tankers, as they were known, then upwards of 150,000 dwt were coming on stream for other Companies making it harder for London and Overseas Freighters Ltd. to compete. In an attempt to offset its losses they converted some of their tankers to carry grain, others went to La Spezia for conversion into bulk carriers, no sooner had all this been realised than the Suez Canal closed for the second time in June 1967, accordingly there was not only a shortfall in tankers available but freight rates soared. On a personal level I was in one of the last northbound convoys to clear the Canal before it closed. In the summer of 1965 ‘BM’ suffered a heart attack which necessitated him standing down as Managing Director, his son Bluey stepped into the breach and Stanley Sedgewick, the Company Secretary was promoted to Assistant Managing Director. BM at his own insistence retained the Chairmanship; soon he regained his health and was back at the helm. For the fifth year in a row London and Overseas Freighters Ltd. posted a loss, London Overseas Tankers was experiencing similar difficulties, on the plus side London Overseas Bulk Carriers and Welsh Ore Carriers were operating profitably thanks in main to their period time charters. 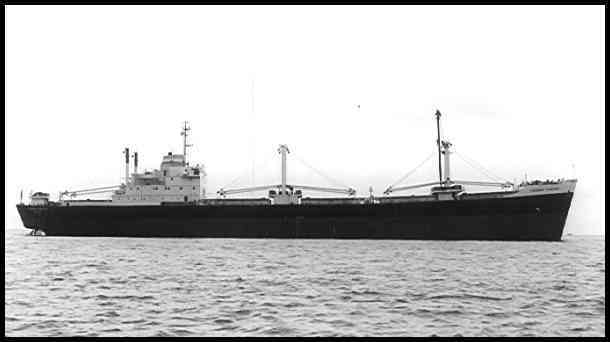 In October 1966 London and Overseas Freighters Ltd. purchased the remaining 50% interest in London Overseas Tankers in exchange for shares in London and Overseas Freighters Ltd., this brought its combined fleet to 23 ships totalling some half a million tons deadweight. To bring this into some sort of perspective two or three ships today would add up to that weight. 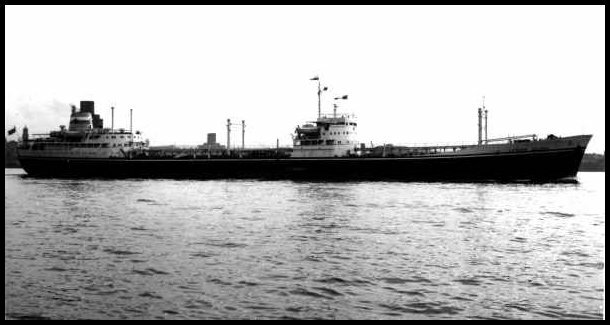 In 1967 London and Overseas Freighters Ltd. were heading for a sixth yearly loss in a row when the Suez Canal shut for the second time, the closure gave London and Overseas Freighters Ltd. a brief respite with tankers being in short supply, the Company turned round an anticipated £1 million loss into a £1.2 million profit year end March 1968. Because of the increase in the number of cargo ships within the Group a now wholly owned subsidiary was set up to act as brokers it was to be called London and Overseas Freighters (Chartering) Limited, also Austin & Pickersgill lost heavily on two contracts but BM remained upbeat in the long term. BM’s confidence stemmed from his own concept of ships to replace ‘Liberty Ships i.e. mass production of the same design with minor differences, they were to be classed as SD 14’s, all shelter deckers of 14,000 dwt, London and Overseas Freighters Ltd. took delivery of the first one in February 1968. There followed a steady flow of orders from overseas, aided by the devaluation of Sterling and easily obtained credit, with full order books London and Overseas Freighters Ltd. purchased another ship builder on the Wear, that of Bartram & Sons Limited. 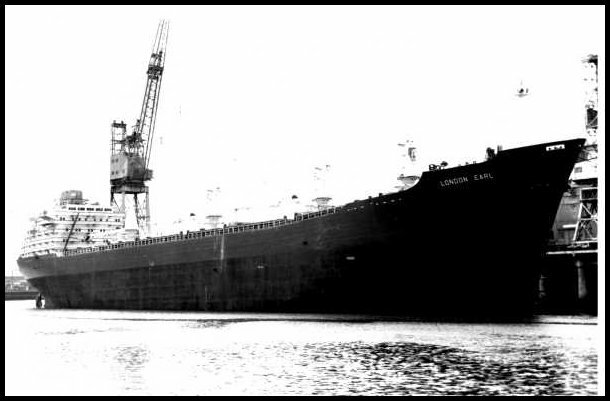 Early in 1969 the Board decided that if London and Overseas Freighters Ltd. was to survive it had to enter very large crude carrier (VLCC) ownership but with the extremely large capital expenditure required it seemed prudent to find a partner, therefore London and Overseas Freighters Ltd. purchased a 50% stake in a concern called London Shipowning Company Limited and the joint venture ordered a 255,000 dwt tanker from Kockums of Sweden for delivery in May of 1971. 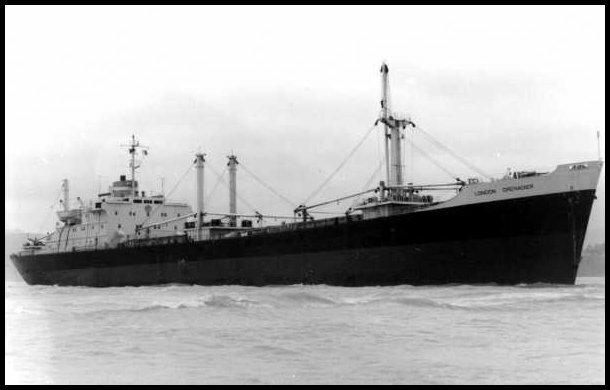 9th April 1970 is recorded as being the saddest day in the Company’s 40 year history when London Valour, a 24,900 dwt bulk carrier carrying 24,000 tons of iron ore from Novorossiysk ran aground and sank at Genoa during a force 8 gale. The ship dragged her anchors during the gale and struck the rocky foundations of the mole, it is fitting to pay tribute to the gallantry of Officers, Crew and Citizens of Genoa but for whose bravery the loss of life would have been far greater. Built: 1956 by Furness Shipbuilder Co. Ltd., Haverton Hill-on-Tees. Tonnage: 16,268g, 9,497n, 24,900 dwt. Engines: Single Screw Twin Steam Turbines by Richardson’s, Westgarth, Double Reduction Geared to Single Shaft, 8,200 BHP. 14 Knots. Launched on the 12th June 1956, completed on the 6th December 1956. Yard No. 475. She arrived at La Spezia, Italy on the 18th December 1966 for conversion to a bulk carrier by Industria Navali Meccaniche Affini; After conversion her tonnage changed to 15,875g, 9,102n, 24,700 dwt. After the iron ore had been removed from the stricken vessel she proved impossible to refloat and so she was cut in two by way of number two hold. The stern section was refloated but it sank off Cape Corso whilst on its way to be scuttled at the Balearic Islands, work commenced on the bow section in May of 1972. BM’s faith in his idea of the SD 14 was beginning to pay off for Austin & Pickersgill, they had orders for ships for the next three years and were to win the Queen’s Award for Industry three times, the last in 1977. London and Overseas Freighters Ltd. in a demonstration of its faith placed orders for four and Welsh Ore Carriers a further two, all for delivery in 1972. Also in 1970 London and Overseas Freighters Ltd. became the sole owner of its shipyards by buying up all the remaining shares. 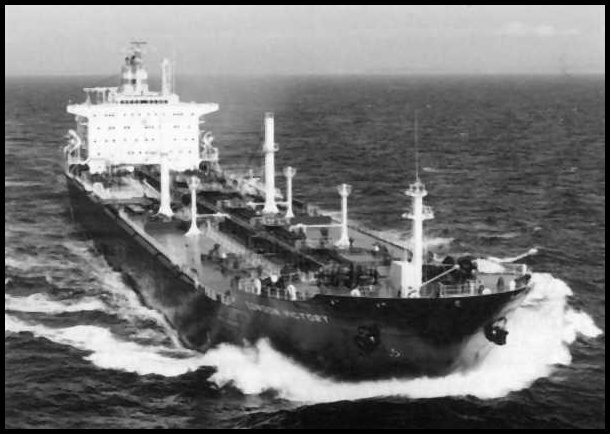 The next year 1971 saw increased profits from its mixed fleet though the freight market appeared to be in some decline, this year saw the delivery of its new VLCC. which was subsequently called London Pride, the previous ship of the same name had been sold for scrap. Total building cost to the Company was £7.5 million on top of that was a grant of £2 million from the Government taking the total building cost to £9.5 million. Because of increased cost and delivery time for this type of ship (twice the previous price and up to four years to build) London and Overseas Freighters Ltd. decided to order no new tonnage before the end of 1972. The Company had a brief fling with oil exploration in the North Sae, alas with no significant discoveries it sold its interest in 1984. Built: 1971 by Kockums M/VA/B Malmo, Sweden..
Tonnage: 125,337g, 107,782n, 255 090 dwt. Engines: Single Screw Twin Turbines by Stal-Laval Kockum, Malmo, Double Reduction Geared, 32,000 SHP. 15.5 Knots. Launched on the 13th February 1971, completed on the 6th April 1971. Yard No. 529. On the 28th April 1981 she was laid up at Piraeus, Greece and just over seven months later she moved to Itea. On the 1st March 1982 she was transferred to London and Overseas Freighters PLC before being sold seven months later through intermediates to the Tien Cheng Steel Manufacturing Company Ltd. For demolition, work commenced 22nd October 1983. In 1972 London and Overseas Freighters acquired an additional 30% of London Shipowning at a cost of £1.75 million with Welsh Ore Carriers interest it brought its total stake in London Pride to 85%, the ship on a three year charter for BP was anticipated to pay for herself by June of 1974. to follow the BP charter London and Overseas Freighters PLC had secured a further 10 year time charter with the Newfoundland Refining Company which should have made the ship extremely profitable, as only time was to tell this was not going to be the case. 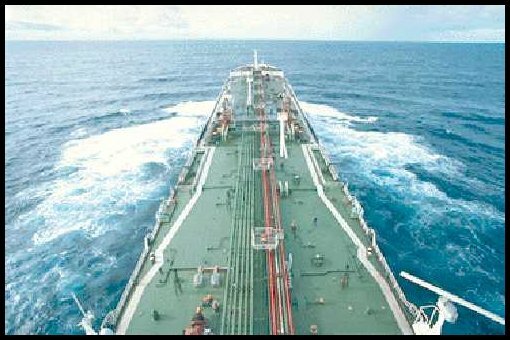 At the end of 1972 the Company decided against the VLCC’s and went for a more flexible approach ordering along with partners three new tankers for delivery August 1974 through to September 1975 from Gotaverken of Sweden at a weight of 138,500 dwt for a cost of about £10 million each. At the time of ordering the tanker market was buoyant so it was decided not to seek any restrictive charters or period employment for the new tonnage. Built: 1972 by Austin and Pickersgill Ltd, Sunderland. Tonnage: 9,210g, 6,091n, 14,900 dwt. Engines: Single Screw, 5 Cylinder 2S.C.S.A. Sulzer, 7,500 BHP. 14.5 Knots. Launched on the 17th February 1972, completed on the 28th April 1972. Yard No.432. After only seven years service she was sold to Clyde Maritime Ltd, Cyprus and renamed First Jay on the 27th September 1979. In 1986 she was sold to Maunland Navigation Inc of the Philippines renamed Simara Express and in 1992 was still in service. Built: 1972 by Austin Pickersgill Ltd, Sunderland. Engine: Single Screw, 5 Cylinder 2 S.C. SA Sulzer by Hawthorn Leslie, Newcastle, 7,500 SHP, 14.5 Knots. Launched 26th April 1972, completed 16th June 1972. Yard No. 433. 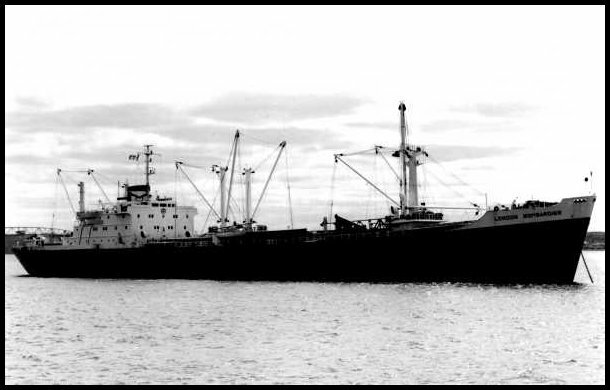 A dry cargo vessel, sold to Chian Chiao Shipping Private Ltd on the 11th of October 1979 and renamed New Whale. 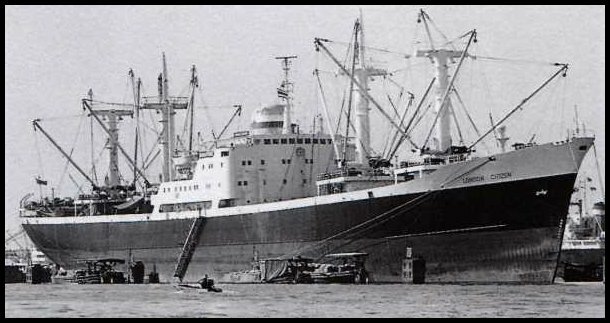 After her owners were compulsory wound up she was sold in 1985 to Well World Navigation S.A. of Hong Kong becoming Her Loong under the Panamanian flag; She caught fire when discharging a cargo of peppermint oil and menthol crystals in number 5 hold when in Hamburg on the 11th of May 1987. Considered a total loss she arrived at Valencia for breaking by Aguilar Y Persis on the 14th of July the same year. Launched on the 22nd November 1972, completed on the 12th January 1973. Yard No.436. Sold like her sister after only a short service to Easton Maritime Corporation of Greece and renamed Akarnania. Sold on once more to Viking Traders Navigation Ltd (Mayfair) of Cyprus, renamed Jute Express and in 1992 was still in service. In the face of a downturn in world wide ship new builds Austin & Pickersgill still managed to turn in a healthy profit and had also added to the SD14 another new concept the B26, an all purpose 26, 000 dwt bulk carrier. At this juncture in time the Government of the day was attempting to modernise the Country’s shipyards and asked all concerned to submit plans for developing ideas first outlined in the Booz Allen Report, it was anticipated that the Government would participate in the form of financial assistance. As all best laid plans flounder this one was to be no exception, procrastination, election, New Labour Government bent on nationalisation all led to a piecemeal operation being implemented which at the end of the day did no-one any favours least of all as usual, the taxpayers. In 1974 London and Overseas Freighters made a brief foray into the air industry buying into I.D.F. Fanjets Limited, the operation failed to live up to its high profile promise and was wound up, fortunately for London and Overseas Freighters they were able to recover all their investment. 1974 proved to be a disaster for tanker owners worldwide, OPEC had increased the price of crude to unsustainable levels bringing many manufacturing countries to their knees, 10% of the world tanker fleet was laid up, London and Overseas Freighters faired much worse only one of its ships was operating, the rest being laid up, even new tonnage being delivered went straight to lay up berths. In 1975 the Newfoundland Refining Company which had chartered London Pride found itself in financial difficulties, subsequently the Company was declared bankrupt in March 1976 only two years into the proposed ten year charter. The ship which had been operating at a £2 million a year profit now found itself languishing on the spot market, a bitter pill for London and Overseas Freighters to swallow. In an attempt to consolidate its position and in anticipation of a resurgence in the world economy London and Overseas Freighters decided to sell some of its older ships, to this end five tankers, six bulk carriers and one cargo ship found themselves with new owners. Three laid up tankers were re-commissioned for service and started trading on the spot market in July 1976. Having been the Managing Director since 1966 Bluey Mavroleon for personal and family reasons decided to take up residence in Switzerland, though staying on the board he relinquished the role of M.D. His position was taken by Stanley Sedgwick, one time secretary of the Company way back in 1949. Stanley Sedgwick’s position as deputy M.D. was taken up by Miles Kulukundis (nephew of George) who had been on the board since 1967 and had looked after the day-to-day running of the family’s shipping interest. Because of tonnage surplus worldwide and the effect that it had on freight rates in 1977 London Pride was laid up in Greece in June. After three years of prevarication the nationalisation of the shipyards finally happened, on the 1st July 1977, too little, much too late, nevertheless London and Overseas Freighters received a much needed liquidity boost to its depleted coffers, E. A. Mackenzie, the Group Fleet Superintendent, was appointed to the Board and London and Overseas Freighters bought out the remaining shares in the London Shipowning Company making it a wholly owned subsidiary. Built: 1977 by Austin and Pickersgill Ltd, Sunderland. Tonnage: 15,884g, 11,033n, 27,107 dwt. Engines: Single Screw, 6 Cylinder 2S.C.S.A. Sulzer, 9,900 BHP. 14.5 Knots. Launched on the 1st June 1977, completed on the 9th September 1977. Yard No. 909. 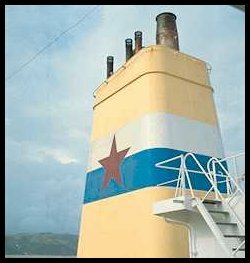 She was sold out of the Fleet on the 22nd of March 1983 to Severna Shipping Panama SA of Panama and renamed Olympic Liberty. In 1988 she was sold to K/S Staberg of Norway renamed Staberg and was still in service in 1992. On the 30th November 1978 BM died, he had participated at the Company’s inception thirty years earlier with his cousins and had seen the Company grow from nine old second-hand tramp steamers worth less than £1 million to a fleet of sixteen modern ships in which the Company has invested some £73 million, he was succeeded by Manual Kulukundis, his cousin himself a founding Director. In December 1978 after being laid up for sixteen months London Pride was re-commissioned and entered trading as the recovery in the tanker market commenced, she was joined by the 138, 680 dwt tankers, however the SD 14’s began to suffer the effects of containerisation and were barely making a profit. A new appointment to the Board in May 1979 was Derek Kimber who brought with him a wealth of knowledge on ships and shipbuilding, he was also involved with various bodies concerned with maritime interests, not least of all the Royal Institute of Naval Architects of which he was the President. During this year London Statesman was sold along with four SD’s, the tankers were also suffering lean times barely turning in a profit, some even trading at a small loss. 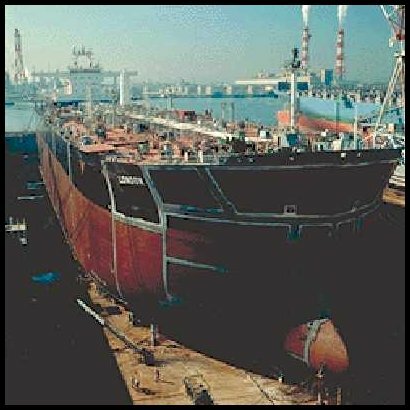 With a view to the future the Company ordered in 1980 two new tankers from Mitsui Engineering & Shipbuilding Ltd for delivery in 1982, the ships were of 55,200 dwt each, both incorporating the latest in design, equipment and safety. Eddie Kulukundis joined the Board after the death of his uncle John who died in the September, his experience was in tramp shipping where he had gained valuable knowledge of the industry. London Pride found herself laid up again in 1981 because of the fall in demand for large tankers, the three 138, 680 dwt tankers even failed to cover the cost of their own depreciation. To comply with the Company’s Act 1980 London and Overseas Freighters became a PLC and is referred to as such from now on, The London Confidence was sold for scrap and after being laid up for three months Overseas Adventurer follows her to the breakers yard. In 1982 London and Overseas Freighters PLC purchased the remaining 49% in welsh Ore Carriers from the West Wales Steamship Company with which London and Overseas Freighters PLC had run a joint venture for twenty years, the partnership had started with one 28,000 dwt cargo ship which had risen to five totalling a combined tonnage of over 100,000 with the fall in demand the number of ships had dramatically slumped to just one vessel. This vessel, formally known as Welsh Voyager was integrated into London and Overseas Freighters PLC’s own Fleet and was renamed London Voyager. London Pride and London Glory also joined her in the same year as London Shipowning Company’s corporate identity was removed. London and Overseas Bulk Carriers having disposed of its only ship Overseas Adventurer was also wound up this year, London and Overseas Freighters PLC received £226,503 when the Company ceased trading. Even after all this consolidation and centralisation 1982 proved to be a disastrous year for London and Overseas Freighters PLC, worse than 80/81 combined, world trade was shrinking as was industrial output, it naturally followed that demand for oil also dropped, carriage of oil by sea dropped by 15% subsequently laid up tonnage increased from 40 million to 84 million dwt for tankers and from 1 million to 12 million dwt for bulk carriers. In its entire Fleet only two ships were turning in a profit, they were London Spirit and London Victory, both new 61,000 dwt tankers that had entered the Fleet this very year. Built: 1982 by Mitsui Engineering & Shipbuilding Co. Ltd, Japan. Tonnage: 36,865g, 16,760n, 61,174 dwt. Engines: Single Screw , 7 Cylinder 2S.C.SA Burmeister and Wain, 15,000 BHP. 15.5 Knots. Launched on the 19th June 1982, completed on the 4th November 1982. Yard No. 1241. On the 1st January 1983 Stanley Sedgwick became Joint Chairman and Miles Kulukundis took over the role of Managing Director. Also this year the recession was taking its toll on London and Overseas Freighters PLC ability to survive in an ever contracting World market, in response they sold their remaining bulk carriers and decided to concentrate on the tanker market alone, by this time the London and Overseas Freighters PLC Fleet was down to four wholly owned tankers and a half share in a fifth ship. An unfortunate side effect in the reduction of the Fleet also meant that jobs were lost and a total of 120 personnel were made redundant, both ashore and afloat. 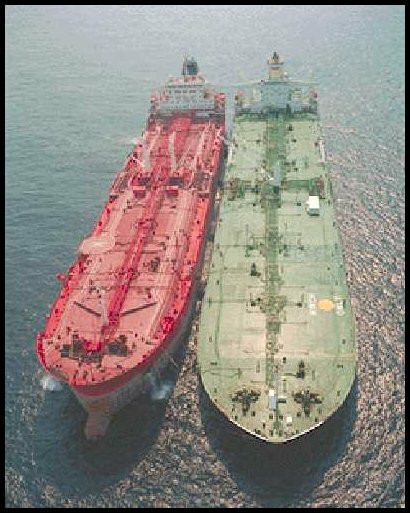 With the introduction of new regulations on pollution and safety and America’s insistence that all ships over 40, 000 dwt had to be fitted with inert gas systems the number of tankers worldwide began to diminish. There was a drop in laid up tonnage of 20% and by the year’s end 80% of all laid up tonnage consisted of ships of 200,000 dwt or more, London and Overseas Freighters PLC sold its only super tanker London Pride in October of this year for scrap. In June of 1984 London and Overseas Freighters PLC moved its offices from Balfour Place in the West End of London to 15, Fetter Lane in the City of London. Since 1980 the Company had been suffering losses which unless it was able to turn round would seriously undermine its very existence, to help with cash flow problems the Company renegotiated its long term borrowings from its Bankers and through a rights issue raised £9 million, it was hoped that the cash injection would ease the mounting pressure to sell more of its assets. Derek Kimber became sole Chairman this year when Joint Chairmen Stanley Sedgwick and Manuel Kulukundis both retired, Manuel Kulukundis because of his involvement with the Company was appointed to the role of President. In an attempt to diversify London and Overseas Freighters PLC bought a 50% stake in Storoil Systems Ltd., redundant super tankers would be used as storage facilities at offshore oilfields. Sadly the investment came to nought and the Company was wound up in 1985. In November of 1984 Ronald Llian, a former Managing Director of BP Shipping, joined the Board of Directors and two months later E. A. Mackenzie and Peter Medcraft retired. With still too many ships chasing too little cargo London and Overseas Freighters PLC’s fortunes slipped even further in 1985 with bankruptcy becoming a real possibility. To stave off its creditors the Company sold all three of its 138,680 dwt tankers, also all non-shipping assets were disposed of this left just two ships in the Fleet, London Victory and London Spirit, this prompt action by the Board allowed the Company to avoid receivership. Again many ships staff and shore side personnel had to be made redundant, a knock on effect was that in the light of its diminishing assets four Board Members also felt that they had to resign, Bluey Mavroleon, Charles Lyons, Eddie Kulukundis and Ronald Llian all left the Board on the 11th December 1985. By March 1986 the Company felt that it had turned the corner when the world economy began to pick up, earnings from its two remaining ships still turned in a loss but still represented its best half year since 1980, it was thought at the time that its disposal of its three tankers a year earlier had been somewhat precipitous. Built: 1982 by Mitsui Engineering & Shipbuilding Co. Ltd., Chiba Works, Ichihara, Japan. Tonnage: 36,865g, 16,760n, 61,116 dwt. Engines: Single Screw, 7 Cylinder 2S.C.SA Burmeister and Wain, 15,200 BHP. 15.5 Knots. Launched on the 7th April 1982, completed on the 30th June 1982. Yard No. 1238. Saudi Arabia along with other members of OPEC substantially reduced the price of oil and upped its production in the first half of 1986, this combined with a high scrapping rate of tankers led to an upturn in the demand for chartered tonnage. The fortunes of London and Overseas Freighters PLC ‘s two remaining tankers prospered in fact conditions were the best that they had been for ten years, a knock on effect was that less tanker tonnage was being offered up for scrapping some 30 million dwt in 1985 had now fallen to half that amount. The world started to stockpile its supply of oil in an attempt to cushion problems envisaged should a return to pre-1986 levels of production return, they didn’t have to wait long, in response OPEC slashed production and increased its prices forcing the tanker market into yet another recession. By April 1987 stability returned once more but despite an upturn in freight rates the Company still had to service its deferred loans which now stood at $21.16 million. In September 1988 the Company reached an agreement with the Banks to settle the account with a one off payment of $6.5 million. In order to finance the settlement the Company created 13.75 million B Preferred Ordinary Shares of 25p, offering 11,250,000 to existing shareholders at 40p, the remainder were taken up by the Banks as options up to 31st December 2003 and the Company which retained 294,118 shares. The offer was underwritten by Seneca Shipping Company Inc. of Liberia whose principal place of business was Hamilton in Bermuda. In August of 1988 the President of the Company Manuel Kulukundis died in New York weeks short of his 90th birthday, he laid down the foundations of the Company along with his cousin Minas Rethymnis in 1920, his stature had increased along with that of his Company and was recognised Worldwide as a Doyen of Greek ship owners. In December yet another member of the Family died, not formally associated with the Company nevertheless he was a founder shareholder and father of the current Managing Director, his name was Captain Nicholas Kulukundis. Fate was to intervene once more before the year was out when Minas Kulukundis boarded Pan Am Flight 103 to attend the Captain’s funeral in America just before Christmas. Along with all the crew, passengers and villagers, he was the victim of terrorists when a bomb exploded over the small village of Lockerbie. What was hoped to be the final financial restructuring of the Company took effect in April of 1989, the share capital of the Company reduced from £19.75 million to £3.75 million and was consolidated into 15 million new 25p ordinary shares. To the Company’s regret existing shareholders only took up 28.56% of the issue, so as the underwriter the bulk of the remaining shares fell to the Seneca Shipping Company Inc. making them the majority shareholder. In order to strengthen a much-depleted Board of Directors now reduced to two, Eddie Kulukundis, Michael Kulukundis and Maryellie Johnson were all invited to join, all accepted. A reversal of the Company’s fortune occurred in 1989 after financial restructuring and the Company was able to post a profit for the first time since 1980, also a dividend was paid to shareholders, the first since 1981. 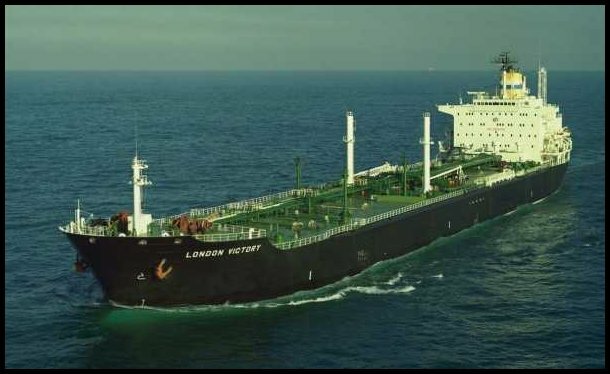 In July of 1989 the Company secured a two year time charter with Chevron for the London Victory, meanwhile London Spirit traded profitably mainly to America on the spot market. In percentage terms oil consumption increased by 2.2%, OPEC increased its production by nearly 10% and the sea borne oil trade increased by just over 9%. Because of its insistence of only employing Officers and crew of the highest calibre coupled with its demand for safety at the highest level London and Overseas Freighters PLC was ideally situated after the sinking of the Exxon Valdez together with other incidents to exploit its prominence as a tanker Company. To this end it was able to secure a five-year charter at increased levels not only for the London Victory but for her sister ship as well, London Spirit. London and Overseas Freighters PLC new found partnership with Chevron was also to bear fruit inasmuch as Chevron proposed similar terms for a 150,000 dwt tanker which had to have a double hull to comply with recent U.S. legislation if London and Overseas Freighters PLC could supply it. With this is mind London and Overseas Freighters PLC formed an alliance with Iroquois Shipping Corporation calling the jointly owned Company Scoresby Ltd., placing an order with Misui Engineering & Shipbuilding of Japan for the said tanker to be delivered in 1993. The ship would initially be time chartered by Chevron for five years. It would seem prudent to mention that Iroquois Shipping was the holding Company of the Seneca Shipping Corporation which in turn was the majority shareholder of London and Overseas Freighters PLC. London and Overseas Freighters PLC saw an improvement in its profits in 1991 which were 15% more than the preceding year and viewed its long-term future with some confidence. The financial arrangements for Scoresby were reviewed by Iroquois and in the final outcome the Nestor, a sister ship to London and Overseas Freighters PLC two other tankers, was transferred with a value of $20.5 million, another $4 million in cash changed hands. All this took Iroquois holdings in Scoresby to 57% and London and Overseas Freighters PLC to 43% but both Companies retained equal voting rights, London and Overseas Freighters PLC was to man and run the Nestor increasing its Fleet to three tankers with one on order. Sadly I have no further information on London and Overseas Freighters PLC, if anyone could bring this narrative up to date I would greatly appreciate it. To summarise it would appear that London and Overseas Freighters PLC had an excellent working relationship with its British Officers and Indian crew. It ran an excellent cadet scheme and apart from the leaner years of the 1980’s had two cadets of each discipline on all ships, when its fortunes changed for the better the Company re-introduced its training scheme on both London Victory and London Spirit. Over its time span the Company often changed its type and size of ships, never was the quality of their operation compromised and whatever the problem both Officers and crew rose to the occasion. When I started to write this story with the aid of the World Ship Society’s book on London and Overseas Freighters PLC I viewed the project with a great deal of trepidation but now that I’ve completed my version I feel all the better for doing it and now understand the complexities of running such an operation. I am currently searching for original photographs of London and Overseas Freighters PLC ships and on receipt will replace the WSS photographs with my own. A couple of days ago I received an email from Johnny M. Kulukundis (Son of Miles and Grandson of Captain Nicholas E. Kulukundis) with additional information on London and Overseas Freighters PLC. It’s a start to finishing the story. Apparently the Company continued to trade until 1998. Mr. Kulukundis attached some photographs which I have put below. I hope to gather additional information on both the ships and the history soon. Built by Hitachi for Rethymnis and Kulukundis. Built by Mitsui in 1995. London Glory is the sister ship of London Pride (built 1993) and London Splendour (built 1995) Both also built by Mitsui. 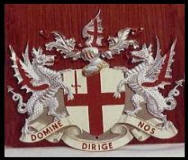 They are now Front Glory, Pride and Splendour respectively. The panamaxs were sold to Peraticos and have been through numerous name changes. They were the London Victory and Spirit ( built by Mitsui) and the London Enterprise.